This entry was posted in Jakarta and tagged Fashion, Fashion Show, Genesis, LaSalle College International Jakarta, Photo Collection on August 6, 2010 by admin. 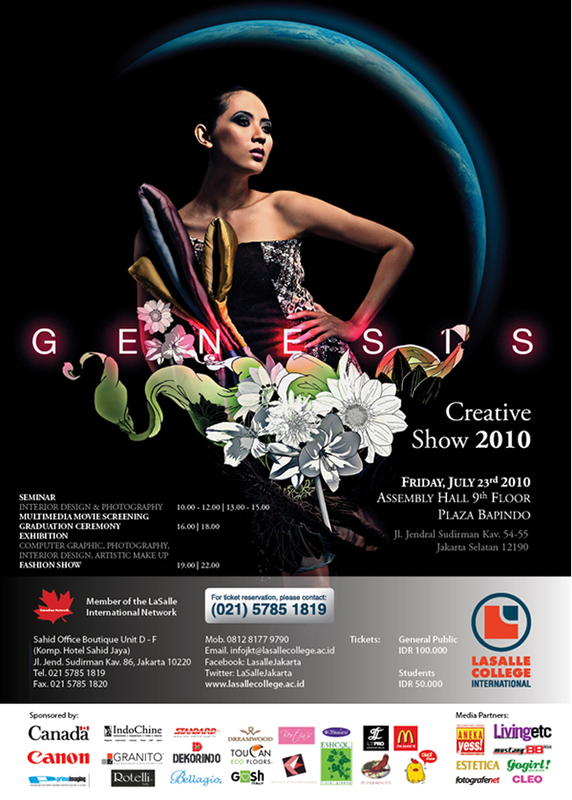 This entry was posted in Jakarta and tagged Genesis, Graduation Show, LaSalle College International Jakarta, LCI Indonesia on July 30, 2010 by admin. This entry was posted in Jakarta and tagged Creative Show 2010. LaSalle College International Jakarta, Genesis on July 30, 2010 by admin. This entry was posted in Jakarta and tagged Genesis, lci Jakarta, Sneak Peak on July 22, 2010 by admin. Ayo nonton film pendek karya anak-anak Lasalle!! Sinopsis : Sebuah Thriller pendek tentang seorang karyawati dan pedagang sate. Sinopsis : Cerita tentang seorang remaja yang terlalu percaya diri yang bercita-cita ingin menjadi seorang pesepakbola professional. This entry was posted in Jakarta and tagged Genesis, Graduation Show, Nadra Suryadarma on July 19, 2010 by admin. LaSalle College International Jakarta is proud to present Genesis, a creative and collaborative event, where Multi Media-Fashion Show, Seminar, Workshop, Exhibitions, Fashion Brand Booths, Multimedia Interactive Works, 3D, Graphics including all the Graduating Students Works are on display for all to see as well as experiencing "Living Through Design." Students from all programs will offer a performance that is unique, original, and will focus on: Fashion Design; Fashion Business; Interior Design; Computer Graphics; Multimedia; Photography and Artistic Make-up. This entry was posted in Jakarta and tagged Fashion Design, Genesis, LaSalle College International Jakarta on July 12, 2010 by admin.